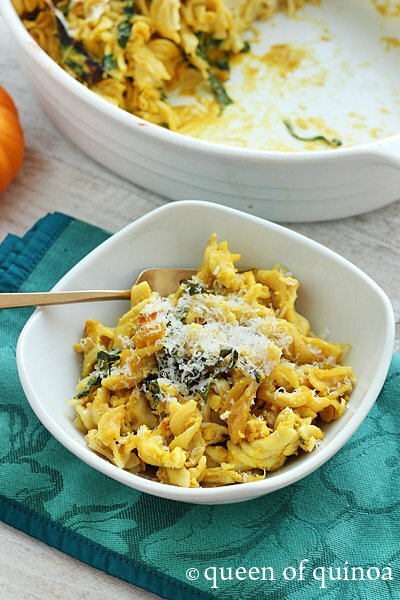 With this dish I've combined the best of both worlds: pumpkin and pasta. It's a perfect meal for those cold winter nights that lie ahead. Rich and creamy, and delightfully gluten-free, this baked pasta sticks to your ribs and will warm your soul. Let's dream for a moment together. It's a cold fall night, we're curled up on the couch, our favorite movie is playing and we have a comforting bowl of this gluten-free pasta in our hands. Steaming, pumpkiny and oozing with cheeze sauce. Sounds like a perfect night to me. Let's come back to reality and talk about the pasta a little bit more. It's kind of like mac n' cheese only better. Yes, I said better. Why? That's simple because there's pumpkin in it. And pumpkin makes everything better. Plus, this gluten-free pasta bake isn't loaded with all those added calories and fat that you're accustomed to with cheesy pasta dishes. The sauce is cheese free. Only a little shredded cheese on top for the crunchiness factor, and that's it. 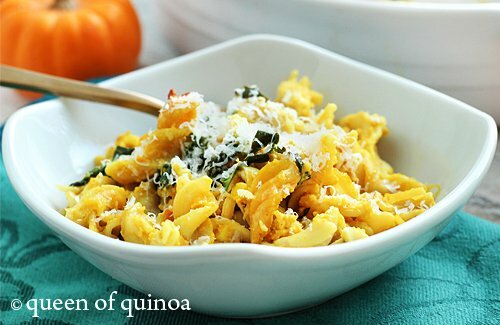 The creaminess in this dish comes from the pumpkin. And that heavenly cheese flavor? That's from the nutritional yeast. How can you go wrong with a healthy pasta bake? Low-calorie pumpkin, with poached shredded chicken, and almost no cheese, is exactly what I'm looking for. I could have this pasta for dinner. Add the water and broth to a small sauce pan and bring to a boil. Add the chicken breast and cook for 3 minutes. Turn down to low for another 10 minutes, until the chicken is fully cooked. Remove from the water and let sit until cool to the hand. Shred the chicken with two forks and set aside. Bring another pot of water to boil and cook the pasta according to the package instructions. Meanwhile, in a small sauce pan, heat the oil over medium heat and add the garlic. Saute until fragrant, about 2 minutes. Whisk in the flour, then slowly whisk in two cups of milk, whisking constantly until combined. Add the pumpkin and nutritional yeast and stir until slightly thickened, about 3 minutes. Strain the pasta and transfer it to a large mixing bowl. Pour the pumpkin sauce over the pasta and stir until fully coated. Stir in the chicken, kale and remaining 1/2 cup of almond milk. Transfer the pasta to a large baking dish and cover with shredded cheese. Bake for 25 - 30 minutes until the cheese is browned. This looks absolutely amazing! Definitely book-marking this and making it asap! 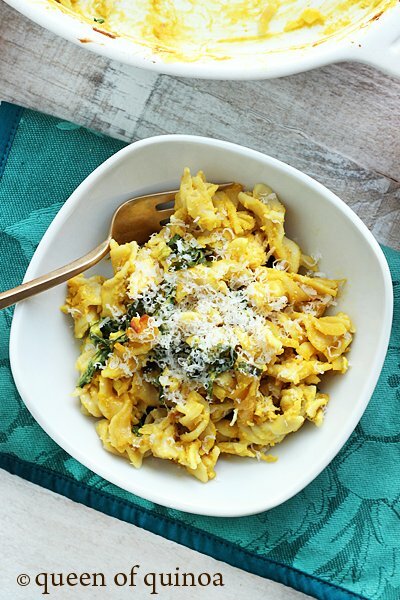 Love the flavors and the creaminess that the pumpkin and goat milk cheddar bring to the dish! Thanks Chrissy! 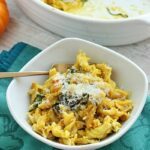 I loved how the pumpkin gave the sauce a sweet undertone, but still making it a savory pasta dish! Hi, do you have any ideas to replace the nutritional yeast? I am super sensitive to foods high in glutamate acid – all forms of MSG larger or small. I am certain it adds a lot of flavor… just no can do. wish I could though. New to your blog—loving it! Where does the additional cup of pasta come from? Hi Debra – it was a typo, thanks for catching it! I’ve updated the recipe to say add the additional 1/2 cup of almond milk.